Brass. The string pad is made of compound cork. Leather neck protection riveted to a thin clock spring is pressed to the neck by an eccentric lever. Adjustment screw for different neck sizes. A slot in the end of the bar prevents it from turning. No patent. Was marketed by GEWA, Germany. 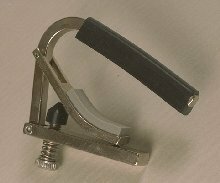 Unknown eccentric lever capo made of cast aluminum alloy. Guide posts at each end of the bar. Plastic tubing protects the neck. No patent. More information wanted. 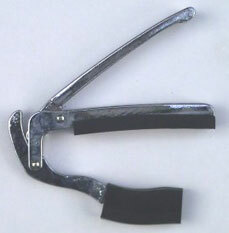 Eccentric lever capo. The eccentric edge is bluntly tothed to prevent slipping. US patent 1979 by John E Bringe. I guess Shubb was inspired by the Bringe capo above. He made the eccentricity of the lever adjustable by the means of a screw. US patent 1981 by Richard Shubb. 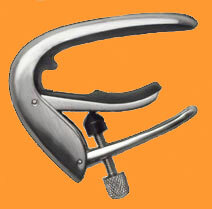 This capo was further developed to fit resophonic instruments. The Deluxe model has a roller bearing on top of the screw. US patent 1998 by Richard Shubb & David Coontz. The partial capo presses down three strings on the guitar, to form either an A major chord or an Esus chord, depending on witch side of the neck you attach it from. Manufactured and marketed by Shubb. Keith Little (well known bluegrass musician) once played at the same gig as Rick Shubb, when Little's capo broke down. Shubb lent a prototype capo to Little, who really liked it. When Shubb turned his back, Little quickly traced the prototype on a pice of paper and had this pirate copy made. Little made good use of it until the commercially produced Shubb capo became available. This happened in the mid 1970's. Del Williams made the copy out of steel and it did have a piece of black rubber glued onto the bottom. 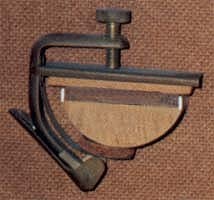 Note the curved tongue and the tapered lever. Keith Little: "I've known Rick Shubb since I was a kid, but I doubt if he knows about this capo. It doesn't matter though, as we never manufactured them for sale, and quickly switched to the commercial models when they came out. Remember, at this time this "over-center" capo idea was brand new, and we were anxious to try it out. I'm grateful to Del for his efforts, and am sure Rick Shubb wouldn't mind a bit." 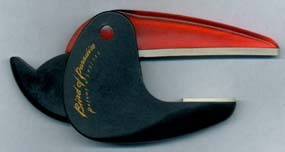 Here is Dunlop's re-design of the original Shubb capo when the patent expired. Cast out of brass. 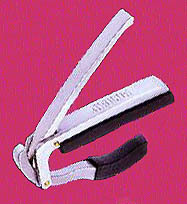 The rubber is an integral part of the capo and can not be replaced. Note the bulge on the rubber that will stop the capo against the side of the neck. The cam-lever arrangement provides continuous adjustability in a single movement. US patent 1995 by John F Wiesenthal. Top levered capo available in black and nickel finish. Made by Nakano Co Ltd, Japan. Same as above, but notice the turnable rubber neck protection to make the capo fit different sized necks.